It all started with a question. On what day did Jesus die? Which led to more questions. Who wrote the Gospels? 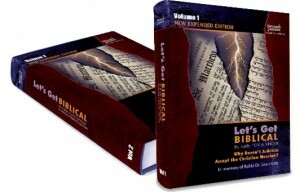 Is the English translation of the Bible accurate? What is the truth? “It just started falling apart,” says Gillah Palumbo. Deeply affected by a church trip to Israel, Gillah and her husband Mark grew curious about Jesus’ world. Upon return to their Seattle-area home they got involved in the Hebrew Roots movement, which infuses evangelical Christianity with Hebrew Bible literacy. But as time went on, their Christian faith continued to erode. Ten years after meeting each other at their Pentecostal church, Gillah and Mark completed an Orthodox conversion to Judaism. BY THE 1960s, two thousand years of Christian antipathy to Judaism was wiping off the ashes of the Holocaust, and Israel’s victory over the Arabs in 1967 was viewed as nothing short of miraculous. Christian Zionism was spreading along with premillennial dispensationalist hopes for the messianic era. Supercessionist theology was partly replaced with the idea that God’s covenant with the People of Israel was still binding. At the same time, the breakdown of the age-old Jewish-Christian divide made way for Jewish converts to Christianity and, in an effort to hasten the Christ’s return, missionary attempts got a twentieth-century makeover. In 1973 Moishe Rosen, a Jew turned Baptist minister, launched the most famous of the missionary organizations, Jews for Jesus, which states its goal as “to make the messiahship of Jesus an unavoidable issue to our Jewish people worldwide.” In a revolutionary move, Jews for Jesus invited Jews to Christianity without divorcing their Judaism. To the horror of the Jewish community—which typically regards Christian interest in converting Jews as amusing at best—the new strategy took hold. According to the Jews for Jesus website, somewhere between 30,000 and 125,000 people subscribe to the syncretic new faith worldwide. What became known as the messianic Jewish movement began attracting more Christians than Jews, drawing heavily from evangelical churches. For many evangelicals, an interest in the early church—formed by Jesus, a Jew, and his Jewish followers—drew them in. Hillary Kaell, a professor of religion at Concordia University in Montreal who has written about messianic Judaism, estimates that 70 percent of attendees at messianic congregations are Christians. “The search for Biblical truth or proper translation is very much usually what brings people out of these charismatic churches,” Kaell explains. Messianic congregations may or may not actively proselytize to Jews. But realizing the threat of Jews for Jesus, by the 1980s the organized Jewish community launched counter-missionary organizations like Jews for Judaism to empower Jews in their own beliefs. (Jews for Judaism’s executive director in Canada, Julius Ciss, was involved in the messianic movement before returning to mainstream Judaism.) Now, in a doubly ironic twist, the anti-missionary materials put out by Jews—the readings and online resources that promote Judaism—are attracting the interest of Christians. The very materials meant to be a bulwark against groups like Jews for Jesus have become one of the conduits for Christians to convert to Judaism. The Palumbos joined a small group of Christians studying Jewish scriptures. It was the first they’d ever heard of the Israelite feasts and other practices that affected Jesus’ life and form the basis of Jewish life today. What started as a study group of 50 to 75 people grew in 10 years to El Shaddai Ministries, a Hebrew Roots church led by Pastor Mark Biltz in Tacoma, Washington. On average, 600 people turn out for El Shaddai’s Saturday services, but according to El Shaddai’s webmaster, the streamed sermons receive around 10,000 hits a week from viewers around the world, not including the YouTube videos, which in a month’s time bring in some 47,000 more views. But the Palumbos weren’t satisfied. Then they discovered “Let’s Get Biblical,” Rabbi Singer’s 24-part audio series directed to Jews that comprehensively dismantles Christian claims. Thirsty for knowledge, they drove around the Olympic Peninsula for eight hours listening and discussing his points. When they finished, they pointed the car toward eastern Washington and did it again. When Rabbi Skobac came to Seattle for a weekend in 2013, they and six friends met with him to discuss the options for living more Jewish lives. Skobac encouraged them to look into the Noachide movement—the diffuse movement of non-Jews committing to the seven Noachide laws—but that didn’t feel like enough. They wanted to talk about conversion. Conversion to Judaism through the Orthodox movement is a notoriously grueling process that involves first getting accepted as potential converts, followed by a crushing literary review, oral exams, and drastic lifestyle changes, including: moving to a Jewish community, swearing off non-kosher food, observing Shabbat and myriad holidays, sometimes changing names and dress, and often losing an entire network of friends and even family. Gillah, who changed her name from Jill, says she sent an email out to every rabbi in the Seattle-Tacoma area expressing her interest to convert. Only one responded. “If he hadn’t replied, we’d still be out there,” she says wearily. It’s no wonder their friends who were also interested in conversion fell away. “It’s a real financial hardship,” Mark says. They now live in a squat brick house on a small lot worth twice as much as their large home outside the city. He estimates the transition to a Jewish life cost them $250,000. “Our friends bowed out because they couldn’t handle it,” Mark says. For those Christians who don’t go through with conversion, some remain in their former tradition, some end up as Noachides, some continue searching, and others fall away completely. A small number of seekers are also drawn to the Karaite movement, an ancient Jewish community that adheres to the literal Torah but not the rabbinic tradition. Since 2007 a small American Karaite community in the Bay Area has converted some 70 people—many of whom are former Christians. MUCH OF THE fluidity of individuals moving between Christianity and Judaism is due to the Internet and social media, and during the spiritual search, the Internet often stands in for community when individuals have nowhere to express their struggles. Aprill Nefores is the founder of the public Facebook group “Leaving Christianity and Finding the Truth,” as well as a private group for individuals not ready to expose their doubts. In December 2014 the former Baptist appeared on the Israeli radio program “A Light to the Nations,” hosted by Ira Michaelson and former evangelical pastor Rod Bryant (now also known as Reuven Dovid, who co-runs the outreach organization Netiv). When Nefores began questioning the tenets of her faith, she felt her pastor wasn’t able to answer her questions adequately. “The answer was always the same: you need to go on faith,” she said in the interview. Nefores also discovered Jewish lineage she didn’t know she had. Her father was Jewish, but only in her own spiritual quest did she discover her maternal grandmother was, too, which precluded her from conversion. (Judaism traces lineage through the maternal line.) “It’s like being born again, again, but for real this time,” she said. Discovery of Jewish roots is a common part of the self-discovery narrative and can take a number of forms, says Kaell: actual discovery of a Jewish relative, a hunch that a grandparent was hiding his or her Jewishness, a suspicion that one’s family is descended from converted Jews, or simply the sense of a “divine Jewish spark” from within. Whether or not the claims are proven true or simply deduced, finding Jewish heritage can validate a Christian’s interest in Judaism, and it can serve as a “born again” moment—as a Jew. “The [evangelical] Christian idea is a sudden discovery of self, where one’s true self is there, but you need that moment of recognition to know it’s there,” says Kaell. OUTREACH PROFESSIONALS like Skobac and Singer admit they never intended to be counseling Christians in crisis. To begin with, Judaism shuns proselytizing to non-Jews, focusing instead on bringing secular or lapsed Jews into the religious and cultural fold. Mark and Gillah Palumbo not only gave up their dream home, but they also lost most of their friends and some of their family. Gillah’s adult children think they’ve joined a cult. Their friends accused them of “crossing over” to Judaism, and their pastor didn’t lead trips to Israel for a number of years, for fear other parishioners would return a little too inspired. Yet as converts they say they haven’t been fully absorbed into their new community, either. Emily Alhadeff is a writer and editor in Seattle whose writing has appeared in Tablet, Moment, and The Times of Israel. She holds a Master of Theological Studies from Harvard Divinity School. Prev:Why do Christians Become Enraged When Fellow Parishioners Choose to be Chosen?